Drew with his favorite teacher! Tuesday found us packing and making our final goodbyes to local friends and family as we head out for our long haul to Florida. 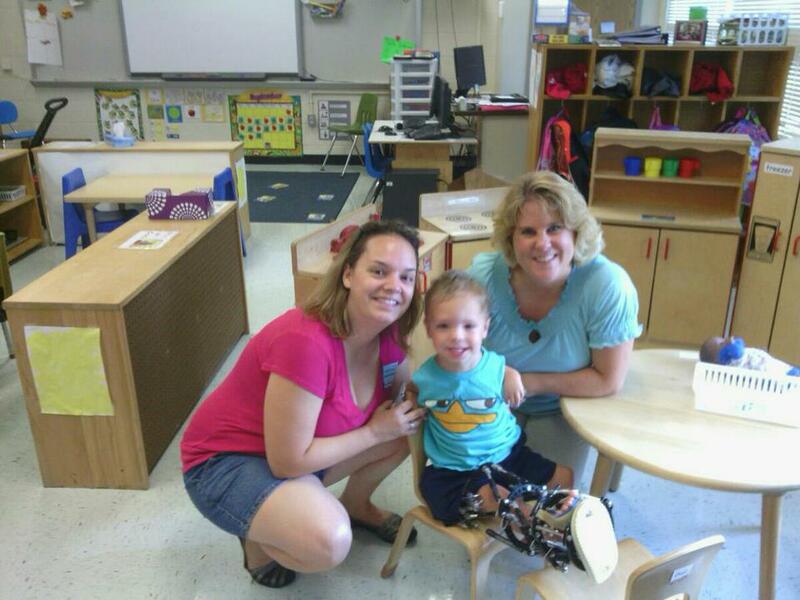 We started the morning off by visiting the Morganfield Elementary School so Drew could visit new and old friends. Meanwhile, I got the oil changed on my truck. We finished packing, hosted a few visitors and we were only 30 minutes behind our planned schedule. The trip to Florida was uneventful. Nearly 17 hours of driving. We arrived to our apartment anxious to see what calamity awaited us. Hurricane Isaac had come through the area and quite honestly, I was sort of expecting a break-in. Don’t ask me why. But, of all things to happen, I assumed it would be missing valuable items. So, when we arrived, I faked the dire need to “powder my nose” so I could rush in anxious curiosity while Nathan unloaded Drew. I immediately looked for the TV which was present. Check. Glanced around the apartment. Wait. What….is….THAT?!? There are what appears to be white stains on the area rug. But, it’s on the recliner too. And, there. And, here. I glance at the ceiling thinking it’s from a leak, but the ceiling is pristine. Upon closer inspection of the white stains, they aren’t stains at all. They are thick substance. Cottony almost. Ugh!! It’s mold! Drew’s chair is infested. There is a very large fuzzy patch on our recliner. It’s sporadic all throughout the living room floor. There is a fine layer on the coffee table and TV stand. It’s in the kitchen. In the floor. It’s in the bathroom all over the shower curtain. I’m reeling in shock. So the cleanup commences. Everything must be cleaned, floor to ceiling. Beds stripped. Kitchen utensils and supplies in dishwasher. Every physical surface in this apartment must be wiped down. Me on my cell phone researching white mold. Nathan attacks the apartment like a squirrel on crack. Back and forth. Here an there. And, in a matter of minutes, every drawer emptied. Every closet emptied. Nothing, and I mean NOTHING, is in its proper place. The apartment is a wreck. Seventeen hours of driving and no relaxing. No sleeping. No kicking back. One of us had to take care of Drew and Nathan seemed to be more up for the cleanup than I was at the moment. I spent a greater portion of the trip doing the driving so I tried to not feel guilty about opting out of the cleanup. But, that was impossible considering Nathan was up until after 4 am doing the cleanup. And, still wasn’t finished. It took another day to get finished. Then, the apartment had to be put back together. Sigh. I have to hand it to Nathan though. He did a great job. He did all the work so he deserves all of the credit. Apparently, Florida’s tropical climate requires lower temperatures in empty dwellings. In Kentucky, leaving your air at 80 while you are gone for extended periods of time is sufficient. But, in Florida, it should be no higher than 75. They should hand pamphlets out when you cross the state border! The humidity in Florida, not mention that Hurricane Isaac had hit the area pretty good, is a breeding ground for mold. Leaving your air no higher than 75 should keep the humidity level under control in Florida. So, all of you considering moving to Florida, take note! Luckily the apartment managers felt sorry for us and offered to vacuum our carpets for free. 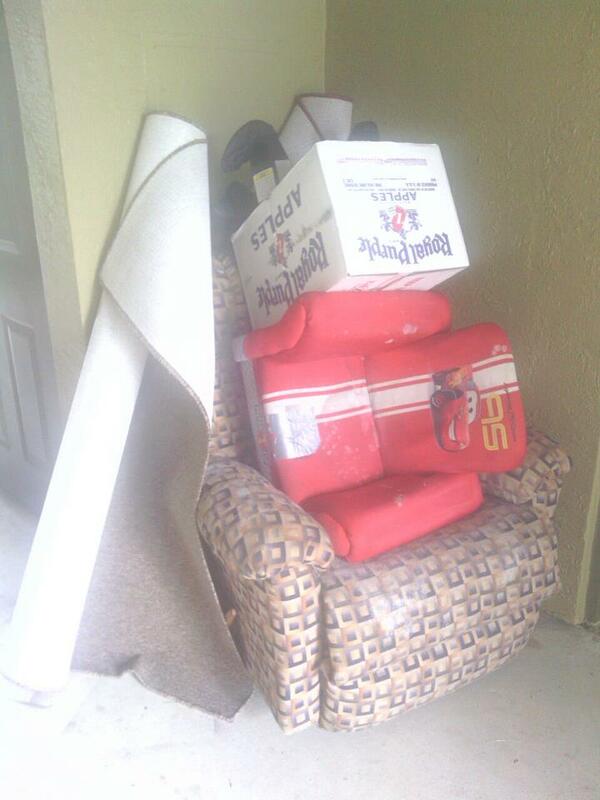 We had to discard of the recliner, Drew’s chair and a few other heavily infested items. Maybe we can claim them on our renter’s insurance. We shall see. And, the bad luck doesn’t stop there. After unloading Drew’s wheelchair and bringing it into the apartment (and it worked perfectly fine during this process), it mysteriously stopped working within minutes of it working fine. I turned it off and literally, less than five minutes later it wouldn’t come back on. Drew was devastated to be without his wheelchair. We’re going to be taking it to some technicians here today, but we have to pay out-of-pocket for it since they can’t accept our Kentucky Medicaid. All this while anticipating a major surgery within the week. So, Drew and Nathan are off to the OUTDOOR swimming pool for some fun while I must get back to my work. So sorry to hear of all the bad luck Janel. Hope things start to turn around for you guys. Praying for you all 🙂 You know the old saying, When it rains it pours – but hopefully a rainbow will be coming your way!